A classic French method for cooking fish or chicken. 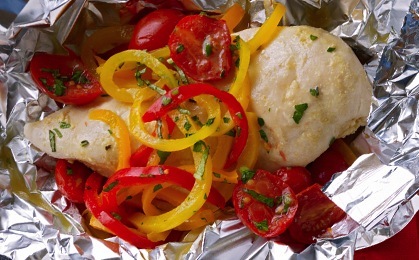 The chicken steams in a pouch with peppers and tomatoes, creating its own sauce. Arrange 4 – 14 inch pieces of tinfoil on a work surface. Season each chicken breast with salt, chili flakes and garlic powder. In a small bowl, whisk together whipping cream, Dijon and chicken stock. Place one chicken breast in the middle of each piece of tinfoil. Top with 1 Tbsp. of butter, a quarter of pepper and tomatoes and sprinkle with Italian parsley. Fold the sides of the foil up around the chicken breasts, making a sort of square bowl and pour Dijon mixture into each pouch. Seal pouches and place on a baking sheet in the oven. Steam for 35 minutes. Open pouches carefully (steam can be very hot). Place chicken breast and vegetables on a plate. Top with sauce and serve.